Here is another easy Spinach Artichoke Super Bowl Recipes. It uses Fleischmann's Yeast for the Focaccia which turns a dip into portable bread bites. Before I give you the recipe I want to share with you a Super Bowl Special Big Game promotion for Fleischmann’s Pizza Crust yeast on their Facebook page. All you need to do is submit your favorite "Big Game" pizza recipe to be entered to win a pizza stone, pizza cutter and other great prizes. I am working on my Big Game Day recipes to share with family and friends. For the day, our group loves to prepare simple, tasty and savory recipes. I tried out this Fleischmann's Yeast recipe to see if it was worth taking on Sunday. It was a hit with my family so I will be making it for game day. 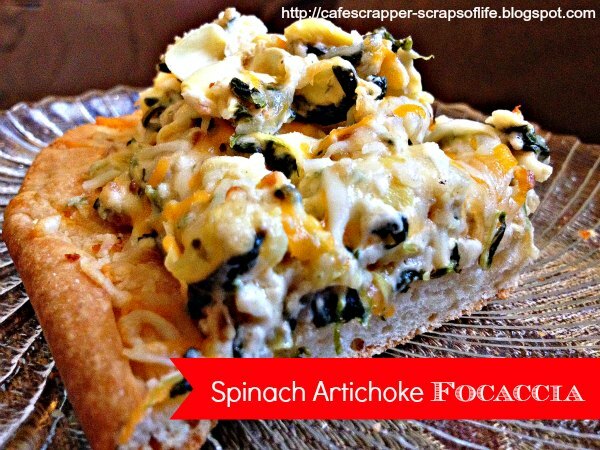 They love spinach artichoke dip and this recipe make for a portable snack because it is layered and baked on top of a home made focaccia. Do you cook or bake from scratch these days? I'm finding more and more that I am going back to the basics and baking from scratch. This focaccia recipe didn't take too long to make and the taste was so much better than a frozen one from the store. It was fresh and didn't have any added preservatives! I was telling my teen, who helped me with this recipe, that 15 years ago I alway made my own bread, hamburger buns,etc. Over time I did stop baking bread from scratch because of all the easy to buy baked goods at the local store. Guess what? My pantry is stocked with Fleischmann's yeast so get ready for more made from scratch recipes here on my blog. I've already found a few more ideas from the Fleischmann's yeast baking website and plan to try out their Fleischmann’s Pizza Crust yeast. Combine 1-1/2 cups flour, undissolved yeast, sugar and salt in a large mixer bowl. Add water and oil and beat for 2 minutes. Add enough remaining flour to make a soft dough. Turn out onto floured counter and knead 5 to 6 minutes, until smooth. Cover dough and let rest 10 minutes. Combine butter and minced garlic; set aside. Roll or press dough to fit into a greased 13 x 9-inch pan. Using wooden spoon handle or a finger, poke holes in dough every 1 to 2 inches. Drizzle with garlic butter mixture. Cover and let rise 30 to 40 minutes, until doubled. Bake in a preheated 375°F oven for 20 to 25 minutes; remove from oven. While focaccia is baking, make the topping. Melt butter in a large skillet over medium heat; add onion and cook 2 to 3 minutes or until onion is soft. Reduce heat to low and add cream cheese, Parmesan cheese, mayonnaise and garlic powder. Stir until blended and softened. Squeeze any remaining liquid out of spinach. Add spinach and artichokes to skillet, stirring to blend. Spread over partially baked focaccia. Sprinkle with Monterey Jack cheese. Return to oven and bake an additional 10 minutes or until cheese is melted. Best served warm. Kitchen Notes: We loved this and it tasted just as good warm as it did cold. One of the teens suggested to use less topping and add chicken next time to make it a meal. I thought that was a great idea and will add it next time. 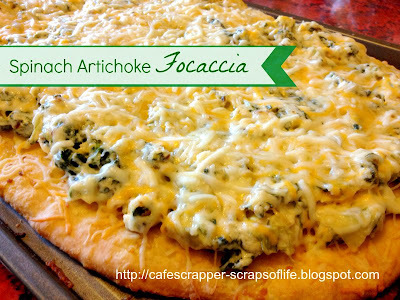 Check out my first Focaccia recipe from a few years back. So what do you think? Will you try this easy to make Super Bowl recipe? What snacks will you make or expect to eat? Which team are you cheering for? This looks yummy! Thanks for sharing. I pinned to try later. I've started baking a lot more than before. It helps that I was given a bread machine for Christmas. I've been making pizza dough in my bread machine and making homemade pizza. Yum yum! Wow that looks tasty!! Pinned for my next party. I'm thinking I may even try it without the mayo and cream cheese, but add more parmesan...? Thanks for sharing this super recipe - I can't wait to try it! YUM! Thanks for sharing. Found you on the Pin me Linky party. Oh my gosh that does look so tasty! Stopping by from Pin Me :). Stop by if you have time Running Away? I'll Help You Pack! Visiting and pinning from Diana Rambles. This looks yummy! This looks like a fabulous appetizer for any party. Hope you are having a great Valentine weekend and thank you so much for sharing with Full Plate Thursday. This looks yummy! Thanks for linking up last week! Love the new blog look! This looks yummy! Thanks for linking up last week love the new blog look! YUMMY! Thanks for sharing this at my Pin Me Linky Party.